This homemade hot chocolate mix is super creamy and SO delicious! You can make a big batch to last you all winter or just a single serving at a time. It makes a great holiday gift idea too! Just layer the ingredients in a jar and attach the printable tags below! I love, love, love this recipe, you guys! If you’ve been around Love Grows Wild for a few years, you might recognize this post. Back in the blog archives, I made a homemade hot chocolate mix layered in a cute, little mason jar, and the post ended up becoming pretty darn popular, especially around the holidays. A lot of you have tried the recipe and said that it needed some tweaking, so I’ve been re-testing it for a few months now and finally came up with the PERFECT ratio of ingredients. You guys were spot on with your suggestions! One with the ingredients listed, but not the amount, so you can fill in your own amounts if you want or leave it blank. One with only the instructions in case you put your own spin on the ingredients in the recipe. P.S. I printed my tags on brown kraft paper for the photos, but you could do it on white cardstock or whatever paper you like! I’ve been drinking this new hot chocolate a lot lately, and it is honestly the creamiest, most delicious hot chocolate I’ve ever tasted. Just the right amount of chocolate with no bitterness, perfectly sweet, and so, so creamy… I think you guys are going to love the new recipe! This homemade hot chocolate mix is super creamy and SO delicious! Make a big batch for the winter or just a single serving. Mix all the ingredients together in a bowl. Add ½ cup of the hot chocolate mix to 1 cup of boiling water in a mug and stir until completely combined. Top with marshmallows, if desired, and enjoy! The ratio of ingredients is 1 part cocoa powder to 2 parts powdered creamer, powdered milk, and powdered sugar. If you want to make a big batch to keep in your pantry, just multiply the ratio of ingredients, mix everything together, and keep the mix in an airtight container. To serve, add ½ cup of the mix to 1 cup of boiling water. This Homemade Hot Chocolate Mix is a great gift idea for the holidays! Just layer the ingredients in a mason jar and add our printable recipe tag! Layer the powdered creamer, powdered milk, powdered sugar and cocoa powder in the bottom of a pint wide-mouth mason jar. 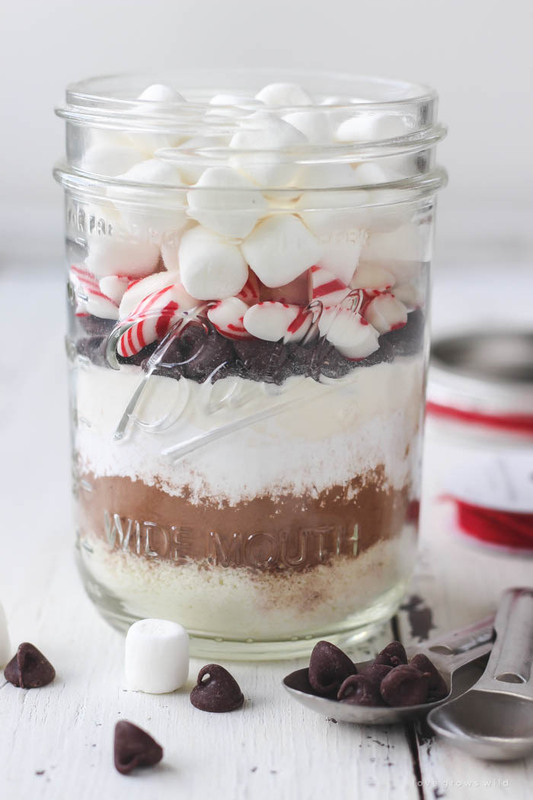 Then add the chocolate chips and candy canes and place the mini marshmallows on top to fill the rest of the jar. 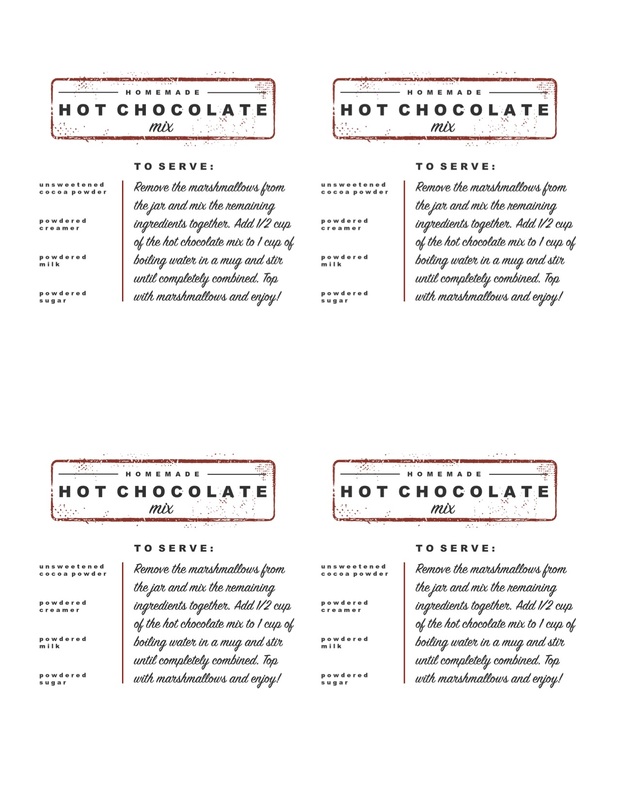 Add a lid and attach a printable recipe tag (see below). When ready to use, remove the marshmallows from the top of the jar and mix the remaining ingredients together. Add ½ cup of the mix to 1 cup of boiling water in a mug and stir until completely combined. Top with marshmallows and enjoy! If you want to make a larger size, use a quart size wide-mouth mason jar and simply double all the ingredients! Keep scrolling to find the printable recipe tags! CLICK HERE to print the tags with the ingredients listed! CLICK HERE to print the tags with only the instructions! My kids love having “cocoa and toast” as a special breakfast during the week and I’ve been searching for the perfect homemade mix. I’ll definitely give this one a go. These are so cute! I was wondering what size canning jar you used for your recipe in the photo? Hi! I made the original recipe a few weeks ago. Any chance I could still get the original recipe printables? Thanks! Hi Beth! You should get about 3-4 servings from the pint size jar and around 6-7 in the quart size. I hope this helps! What type of powdered creamer are you using? Hey Becky! I grabbed a container of powdered coffee creamer that you’ll find in the coffee section of the grocery store. Mine wasn’t any special flavor, but you could try using hazelnut or another favorite flavor! Website is business just FYI. 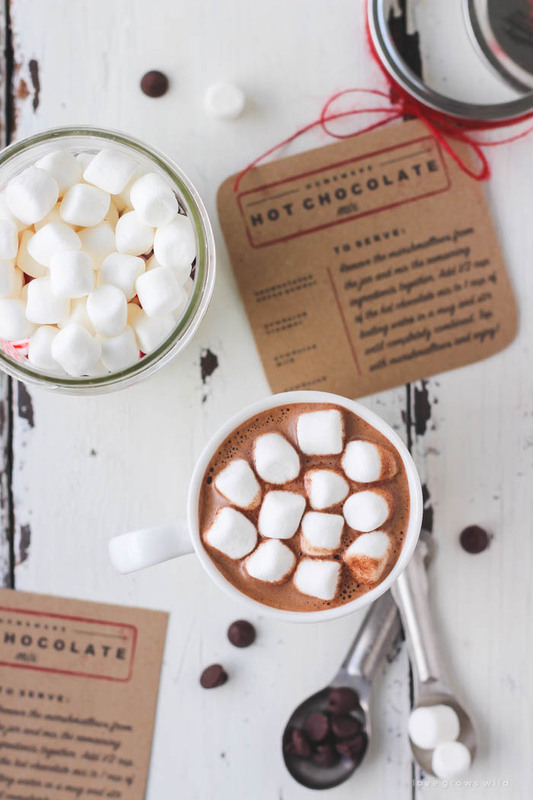 I love the hot chocolate idea and my 3 teenagers will find it in their stockings!! On another note, I have been looking for a way to print recipes for the Olive Oil store. Can I ask what software you use and/or program?? Thanks so much! Hey Jan! Are you talking about have a print feature for recipe that are on your website? Is the cocoa sweet or unsweetened? Hey Nayeon! I used unsweet! Hi! I noticed that the area to click for ingredients actually has the instructions. I clicked on the instructions button to see if maybe it was there, but it has instructions too. Can you put a label for ingredients up? Hey Tracy! I’m happy to help, but just a little confused… can you clarify what it is you’re looking for? If you’re trying to print labels to attach to the mason jars, there should be a link above each set of labels for each printable. The first one will have the ingredients AND the instructions, and the second label only has the instructions. I hope this helps! Let me know if you have any other questions! Great idea ! I was wondering what kind of cocoa powder you used, sweetened or unsweetened ? Hi Crystal! I use unsweetened cocoa powder for this recipe. I hope you enjoy! Hi! If you wanted to do the gift just as a single serving, would it alter the ingredient amounts and size of mason jar? The recipe says to add 1/2 cup of the mix to one cup boiling water but I’d like to do this so the recipient can just make one serving. Would love your advice. This is a super cute idea! Thanks! Hi! Do you still have the print tags for the original recipe that is on your picture? I love the look of that one and have gotten everything to make them and now can’t find the printable tag. Would love it if you still have it. Thanks! Wow, this just made my day! It looks soooooo yummy! 🙂 I was only wondering if the second recipe is for a quart or 1/2 quart? Thanks ! Hey Annie! The second recipe for the mason jar gift is for a pint size jar. For a quart size jar, just double the ingredients! Thanks! 🙂 Happy NY ! Looks delicious! Where did you get the mason jar and what was the price? Also in the mix in the jar there are chocolate chips but not in the one serving recipe. Why? Thanks! Hi Priya! You can find mason jars just about anywhere… grocery stores, hardware stores, or even online. 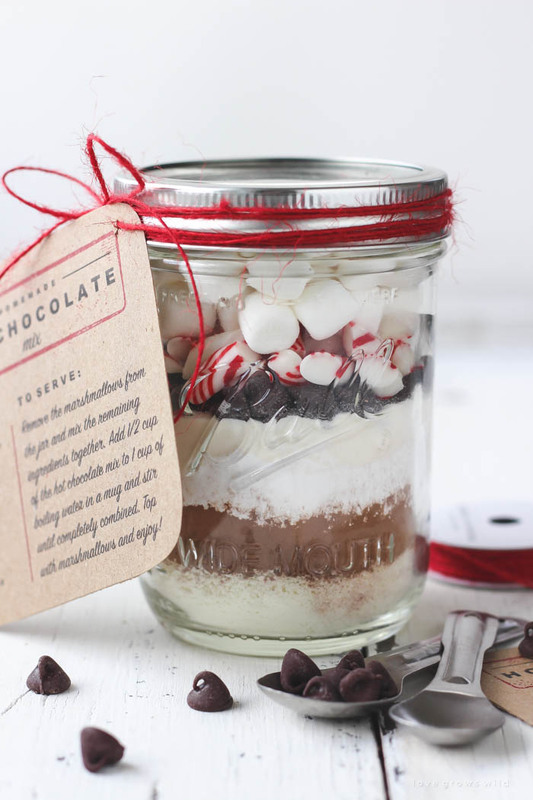 The chocolate chips and candy canes are more for a decorative touch in the mason jar gift, but feel free to add them to your cup of hot chocolate as well! I would highly recommend getting powdered creamer for the recipe, but you can try doubling the powdered milk, if necessary. I hope this helps! When the instructions say to remove only the marshmallows and mix rest of ingredients, does that include chocolate chips? Hi Debbie! You can go ahead and leave the chocolate chips in the mix. They melt nicely into the hot chocolate when mixed with boiling water! Love this idea and wanted to do this with my students. How many pint size jars did your gift recipe mix make? I was wanting to use 8 ounce mason jars and just wanted to make sure I doubled or tripled the ingredients correctly so that all my students could make them. Hi Jane! The 16 ounce pint jars are what I used for the recipe example, so the ingredients listed will fill 1 pint size jar. If you’re using the smaller 8 ounce half pint jars, you’ll need to cut the recipe in half for each mason jar you need. I hope this helps! This recipe looks AMAZING! Perfect for my Christmas gifts. Can I double the powdered creamer if I don’t have powdered milk? I haven’t tried doubling the powdered creamer, but if you try it out, let me know how it tastes! Can’t wait to try this! How many servings do you get from following the new recipe in the pint size Mason jars? And is it okay to you regular mouth jars (not wide mouth)? Thanks again! Hey Sharon! You may not be able to fit as many marshmallows on top if you use a regular mouth jar, but the other ingredients should still fit just fine! The pint size jars should serve 3-4 people. Enjoy! Hi Allison! A quart size jar would serve around 3-4 people, but you can experiment with other jar sizes to get the right serving number you need! I hope this helps. 🙂 Merry Christmas, friend! I made the recipe for the mason jar using 6 tablespoons each of powdered creamer and powdered milk, 3 tablespoons of cocoa powder and 6 tablespoons of powdered sugar. I proceeded to layer it in a pint size mason jar with the toppings. However, the powders ended up taking up 3/4 of the jar leaving barely enough room for toppings. What did I do wrong? I’m not sure, Jakob! Did you use a wide mouth mason jar? It sounds like you had all the ingredients right! Loved this tutorial! I customized it a bit by using half regular creamer/half french vanilla cappuccino mix, as well as 3 tbsp brown sugar and a dash of salt per pint sized mason jar. Skipped the peppermint layer. I made a dozen to give as gifts at the office and it ran me about $45. Thanks a bunch! Loved this tutorial! I made a dozen pint sized jars to give as gifts at the office. Customized them a bit to my taste by using half regular creamer/half french vanilla cappuccino mix, as well as adding 3 tbsp of brown sugar and a dash of salt per jar. Skipped the peppermints. Thanks a bunch! Your jars are so cute! I can’t wait to make them! What brand of cocoa mix or hot chocolate mix did you use? Thanks! Hi Jennifer! I used Nestle brand for mine. Hope you enjoy! For the jar version, do you mix the chocolate chips and candy canes in with the mix, then add it all to the water? Do the candy canes mix up well? I’m making these as gifts, and not sure if everyone likes peppermint. Would it work just as well if I left them out and only did the chocolate chips and marshmallows? Hi Andrea! Yes, I just mix the chocolate chips and candy canes in with everything else. As long as the water is nice and hot, they melt perfectly when stirred. 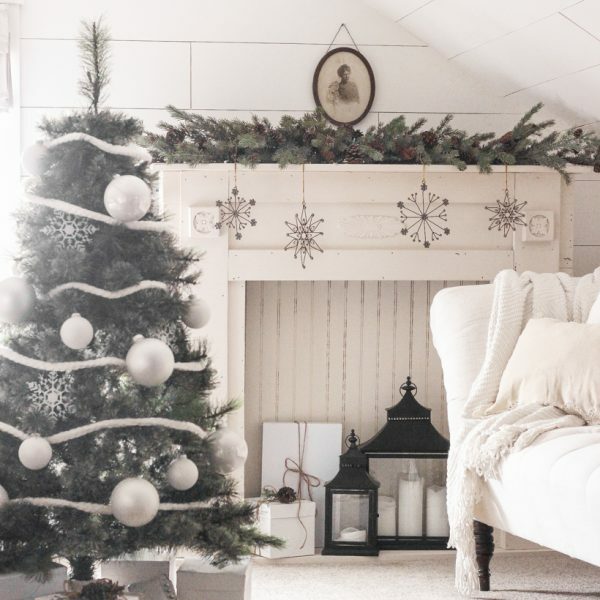 You can leave the candy canes out though, if you prefer! Thanks for the great recipe! A question about the powdered milk…do you use the instant kind of powdered milk, like Carnation, or do you use non-instant powdered milk? Thanks, again. Hi Kim! I use the instant powdered milk. I hope you enjoy! I’m very much looking forward to trying this, but I’m a little confused. The first recipe above does not have chocolate chips in it, but the gift in a mason jar one does. So I’m wondering if you still add the choc. chips in with the recipe for the “gift in a jar” ones? Thanks!! Hi Liz! The chocolate chips and candy canes were just added as a decorative touch in the mason jar, but you don’t need them for just a single serving! I’m making A LOT of these for gifts for the Holidays…looks GREAT!!! I hope I do as good of a job as your pictures?!?!? How do I layer. It looks like the powdered milk first, the cocoa, then powdered sugar and then the powdered creamer. Also, how did you get this in the jar so neatly? Did you use a funnel? Thank you and have a WONDERFUL HOLIDAY SEASON!!! Hi Laurel! I spooned everything into the jars and gently tapped the jar to settle each layer. A funnel would work well also! Sorry I believe I commented on the wrong post . I am making these as wedding favors. I am using 16oz mason jars, would the above ingredients be for that size or for 32oz? Also I really liked your old tags that u said had mistake, do u have updated card that looks exactly the same? Hi Veronica! This recipe is written for the 16 ounce pint size jars, so you should be good to go! Also, I only have the updated tag design… so sorry about that! Hi Liz! These gifts look beautiful! I bought the ingredients to give as a gift during a cookie bake I was hosting, and decided to try the single cup directions myself before I assembled the jars. I’m not sure what I did wrong but it had a strange aftertaste and did not taste chocolate-y at all. Any suggestions of where I went wrong? I followed the 3 T milk/creamer/sugar to 1.5 T cocoa ratio, using newly purchased Hershey’s cocoa. Perhaps it was because the Carnation powdered milk was nonfat? Was the milk you used full fat? Thank you in advance for your advice! Hmm… I’m not sure which powdered milk I used originally, but it shouldn’t make too big of a difference. I’ll have to test that out! How would I go about making this a white hot chocolate recipe? Is there any particular order the powdered ingredients should go in? Just received one of these as a gift last night and they are BEAUTIFUL. My 14 year old niece made it and to say I was impressed is an understatement. Decided to come right out to Pinterest and find it so I can make these for my own for gifts. Thanks so much for posting this. Just a though. 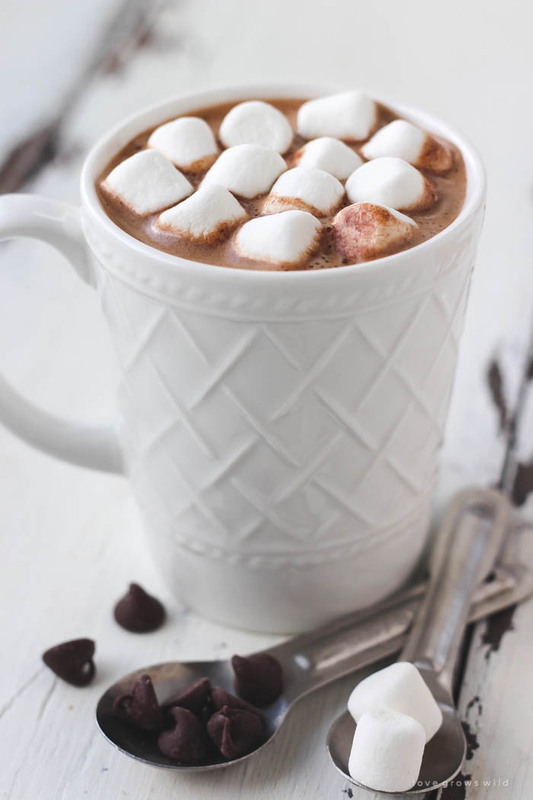 Would wrapping the mini marshmallows in Saran Wrap before putting them in the jar make them easier to remove when you are making the Hot Cocoa? I would want to make these as wedding favors in 8 oz. jars. How should I adjust the recipe and the directions on making it to fit that? 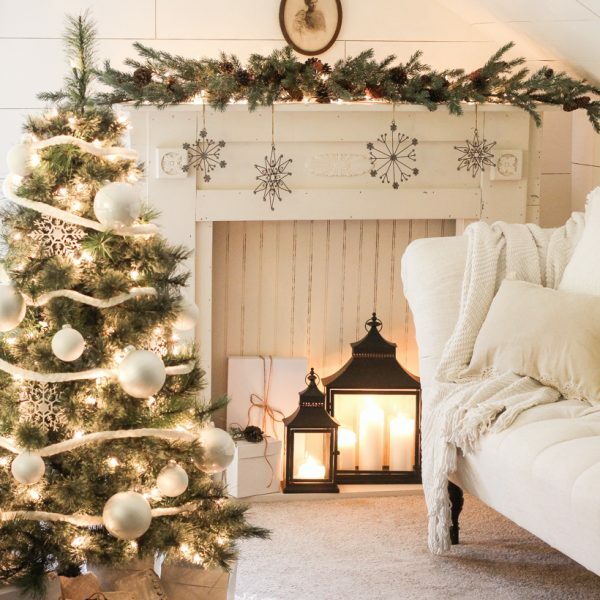 Thanks so much for sharing these wonderful recipes and gift ideas. I AM SO PUMPED ON THIS. I am going to use it in my next week’s YouTube video and credit you..if you don’t mind? I guess my question is the instructions. You need to add more cocoa mix? Hello, Liz! Thanks to your wonderful pint jar recipe, I’m making this for all my kids’ teachers, colleagues, etc. A quick question, how far in advance do you think I can make and keep these? I’m planning on traveling soon and don’t want to be too late on making them. would using white chocolate chips be ok instead of the milk chocolate chips? Is there an adjustment in the recipe I need to change if I use those? 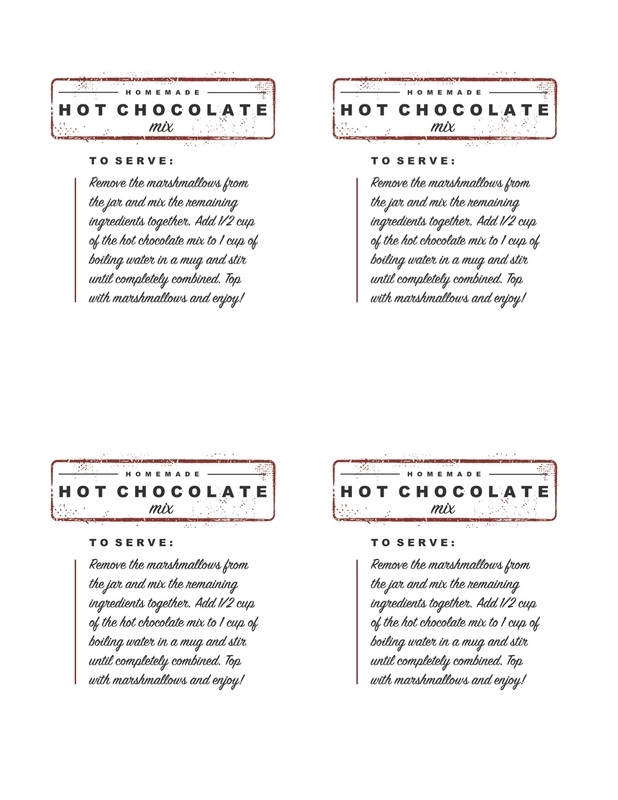 Do you have a card I could print if I was just going to put the hot chocolate mix in a jar – not layered just the mix in a jar. Hi, I LOVE this idea! I picked up wide mouth quart jars, so you recommend me doubling your recipe from your 16oz jar? Or do you think the quart jars will be too big? Wondering what the best powered creamer to use? I tried making this to hand out as christmas gifts, and I must say the way it is described (creamy and delicious) is absolutly accurate. It is so yummy and so cute. I didnt use any type of funnel so it was a bit messy but so much fun to make. The only problem I had was the constant nagging from my toddler to give her more marshmallows and candy canes lol. Thank you so much for this idea, I cant wait to check out your other stuff!.